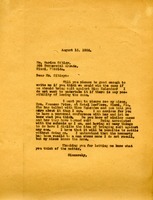 In this letter to Mr. Sibley, Miss Martha asks Mr. Sibley if he has secured the affidavit from Mr. Andrews yet and if he has met with Miss McLendon, Mr. Andrews and her lawyer. 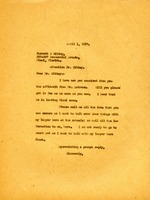 She asks for a prompt reply. 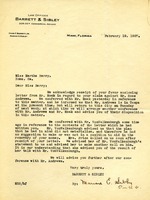 Letter to Barrett Sibley from Martha Berry concerning the affidavit from Mr. Andrews. 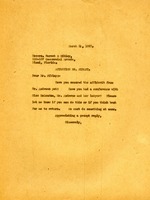 Miss Berry asks Mr. Sibley to send it to her promptly as she has not received it yet. She also asks Mr. Sibley to secure all the data that he can because she wishes to talk with her lawyer at the schools as she is not yet ready to go to court yet. 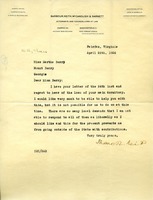 Miss Berry writes to Mr. Sibley to ask him whether or not he thinks they would win the suit against Miss McLenden over property rights.